This is a picture of the golden Cup of Gold Flower taken along the Old Pali Road hiking trail. 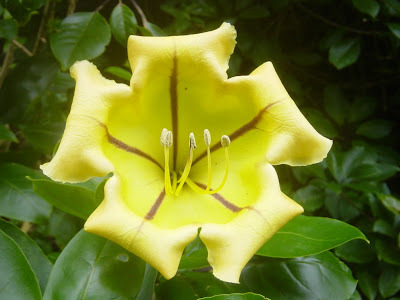 It is the Solandra Grandiflora and native to Mexico and Central America. It is a vine that has these pretty flowers you can see some in the Pali area and also some people in Hawaii have these in their yards mostly in places that receive a lot of rain. This is a picture of the Academy Art Center located in downtown Honolulu. 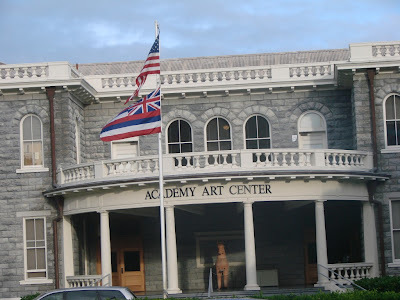 This is a part of the Honolulu Academy of Arts and offers courses in drawing, painting, Chinese brush painting, printmaking, jewelry, ceramics and much more. This it he fountain in the center of Thomas Square Park. 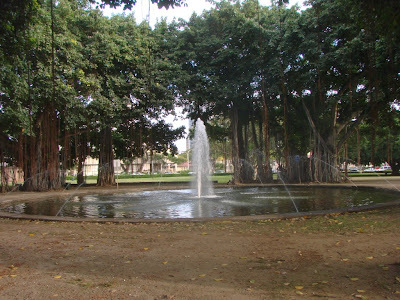 This park located in town at 925 South Beretania Street is across the Honolulu Academy of Arts and provides a nice place for its many craft fairs, pet show and cultural events. You can see a couple of the large Banyan trees that are in the park and whose hanging roots can be nice to swing on.